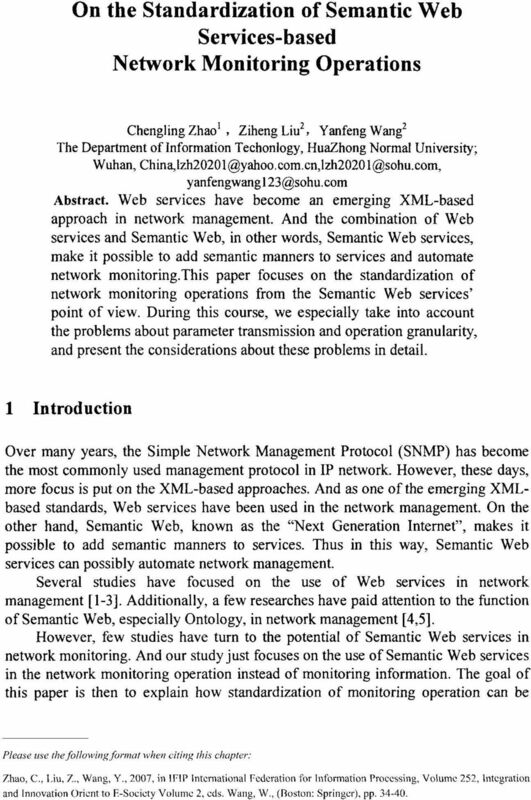 Download "On the Standardization of Semantic Web Services-based Network Monitoring Operations"
2 ChenglingZhaol, ZihengLiu2, Yanfeng Wang2 35 achieved for Semantic Web services by the means of semantic markup languages for Web services, such as OWL-S in our study. The organization of the paper is as follows. We will firstly present Semantic Web services background in Section 2, which is followed by Section 3 about the needs and the markup languages for standardization of network monitoring operations. With the OWL-S, we standardize Semantic Web services-based monitoring operations in Section 5, taking into account the parameter transmission and the operation granularity. We will conclude with Section 5, which gives a summary of this paper. 2 Background 2.1Web services and SOA Web services is developed and standardized by the World Wide Web Consortium (W3C), which gives the following definition : "A Web service is a software system designed to support interoperable machine-to-machine interaction over a network. It has an interface described in a machine-processable format (specifically WSDL). Other systems interact with the Web service in a manner prescribed by its description using SOAP-messages, typically conveyed using HTTP with an XML serialization in conjunction with other Web-related standards". The word "services" in Web services refers to a Service-Oriented Architecture (SOA) . In fact, SOA is a recent development in distributed computing, in which applications call fiinctionality from other applications over a network. In an SOA, functionality is "published" on a network where two important capabilities are also provided - "discovery", the ability to find the functionality, and "binding", the ability to connect the functionality. So when considering a SOA, these three parts must be take into account, which are briefly presented as "publish", "find", and "bind". 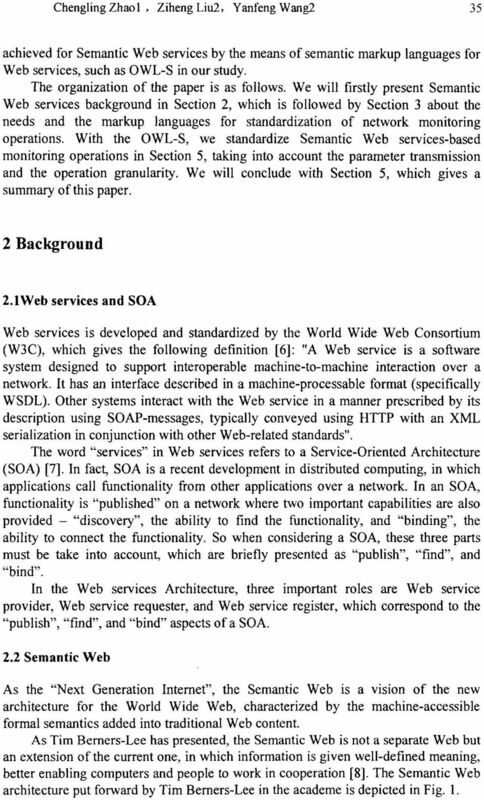 In the Web services Architecture, three important roles are Web service provider, Web service requester, and Web service register, which correspond to the "publish", "find", and "bind" aspects of a SOA. 2.2 Semantic Web As the "Next Generation Internet", the Semantic Web is a vision of the new architecture for the World Wide Web, characterized by the machine-accessible formal semantics added into traditional Web content. As Tim Bemers-Lee has presented, the Semantic Web is not a separate Web but an extension of the current one, in which information is given well-defined meaning, better enabling computers and people to work in cooperation . 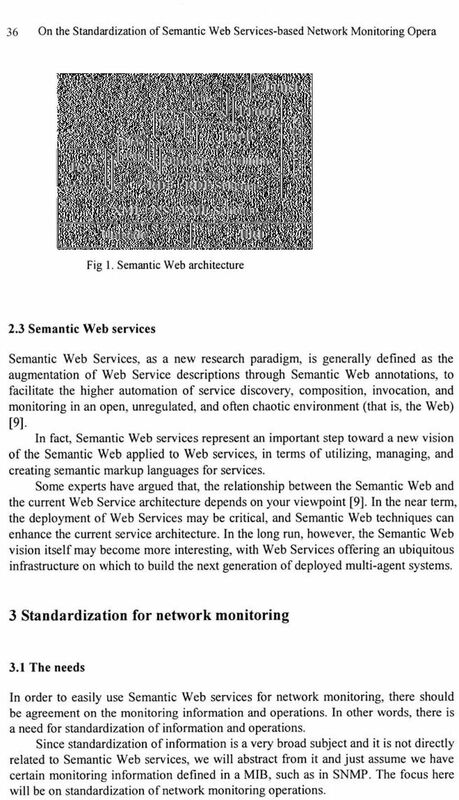 The Semantic Web architecture put forward by Tim Bemers-Lee in the academe is depicted in Fig. 1. 3 36 On the Standardization of Semantic Web Services-based Network Monitoring Opera Text Mata data Trust Rules Ktrrz Proof Data Logic 3 Ontology vocabulary RDF+ RDF Schema XML+ NS+ XML Schema Unicode Fig 1. Semantic Web architecture URI Semantic Web services Semantic Web Services, as a new research paradigm, is generally defined as the augmentation of Web Service descriptions through Semantic Web annotations, to facilitate the higher automation of service discovery, composition, invocation, and monitoring in an open, unregulated, and often chaotic environment (that is, the Web) . In fact. Semantic Web services represent an important step toward a new vision of the Semantic Web applied to Web services, in terms of utilizing, managing, and creating semantic markup languages for services. Some experts have argued that, the relationship between the Semantic Web and the current Web Service architecture depends on your viewpoint . In the near term, the deployment of Web Services may be critical, and Semantic Web techniques can enhance the current service architecture. In the long run, however, the Semantic Web vision itself may become more interesting, with Web Services offering an ubiquitous infrastructure on which to build the next generation of deployed multi-agent systems. 3 Standardization for network monitoring 3.1 The needs In order to easily use Semantic Web services for network monitoring, there should be agreement on the monitoring information and operations. In other words, there is a need for standardization of information and operations. Since standardization of information is a very broad subject and it is not directly related to Semantic Web services, we will abstract from it and just assume we have certain monitoring information defined in a MIB, such as in SNMP. The focus here will be on standardization of network monitoring operations. 4 ChenglingZhaol, ZihengLiu2, Yanfeng Wang The markup languages As for the standardization of network monitoring operations, an appropriate markup language is in great demand. WSDL (Web Services Description Language) [10,11] only provides a mechanism to describe a Web service in a modular manner. This means that a WSDL document can be used jus in the case that the services are not automated. But considering the semantic manners added into the Web services, we need a markup language particularly for Semantic Web services. As is shown in Fig. 2, we can see that XML, RDF and Ontology are three main layers for describing the semantics of Web information. However, RDF and RDF Schema, as well as XML and XML Schema, are not strong enough to express various resources and reason automatically. This has pushed the development of Ontology languages, from DAML (DARPA Agent Markup Language)  and OIL (Ontology Inference Layer) , to DAML + OIL (DARPA Agent Markup Language + Ontology Inference Layer) , and recently to OWL (Web Ontology Language) . And OWL-S , an application of OWL, in particular, has evolved into a semantic markup language for Web services. 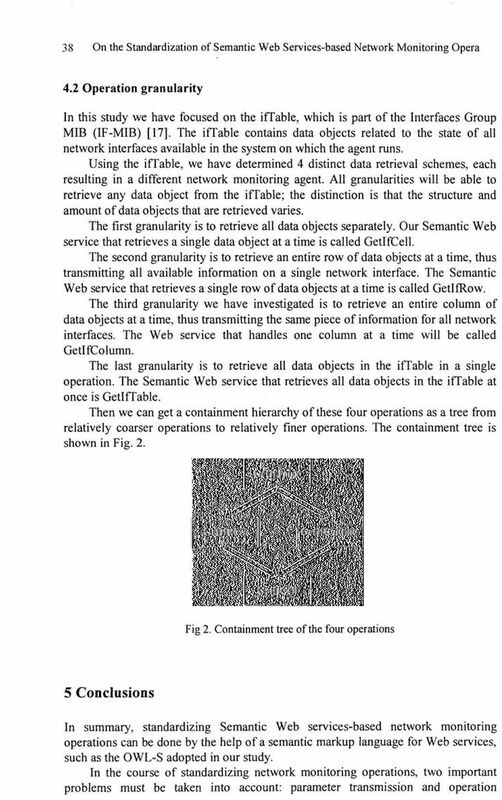 4 Semantic Web Services-based network monitoring operations For standardization, we must consider two significant problems: parameter transmission and operation granularity. 4.1 Parameter transmission Since OWL does not provide for the use of variables, there is no way to state in a class definition that one of the class properties is referenced elsewhere by a variable name, which makes the parameter transmission rather harder. However, the use of parameter binding in a process definition will enable a specialized OWL-S process reasoner to use this information to determine which properties should have "the same value" in any coherent instance of the process being defined. In the notation of parameter binding, an instance of the class VALUEOF, with properties at Process and the Parameter denotes the object (value) of the specified parameter of the specified process. On the other hand, parameters can also be combined and/or serialized in such a way, that the parameters are not described in the Service Model class. Merely their serialization is described in the class Input, a subclass of the class Parameter. Thus in this way, the input parameter is transmitted in data flow. This can be seen as lightweight parameter transparency. An advantage of transparency is that monitoring information is abstracted from the process level, so the structure of information can change without having to modify the operation part. Since the transparent parameters are serialized in an XML structure, it can be contained in a class whose value is a string type. On both the manager and agent side, a generic XML parser can then be used to extract the parameters from the class. 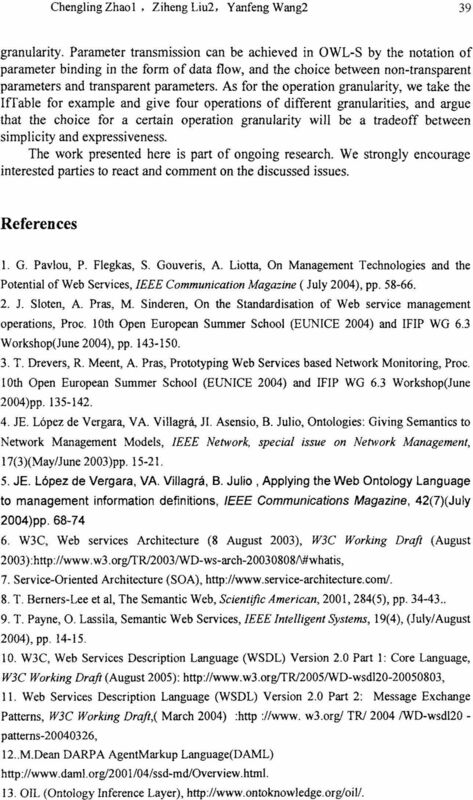 7 40 On the Standardization of Semantic Web Services-based Network Monitoring Opera 14. 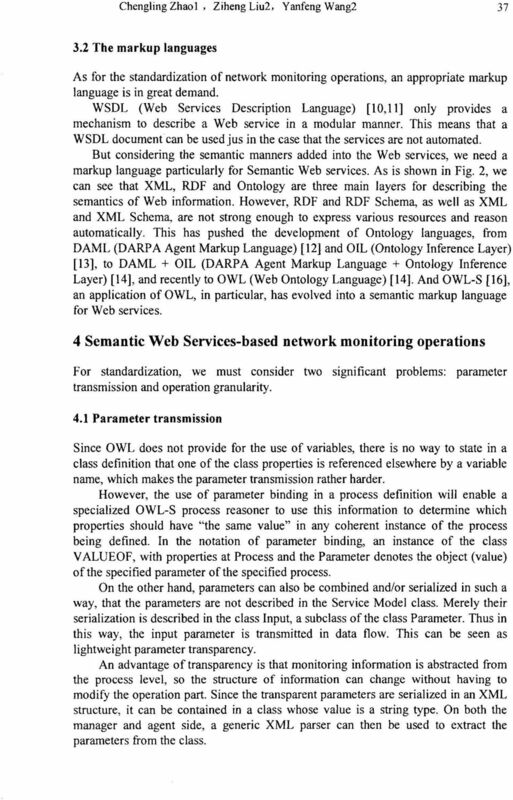 T. Bemers-Lee et al, DAML + OIL (DARPA Agent Markup Language + Ontology Inference Layer), W3C, OWL~Web Ontology Language Overview, W3C Recommendation, (February 2004) w3.org/tr/2004/rec-owl-features /. 16. 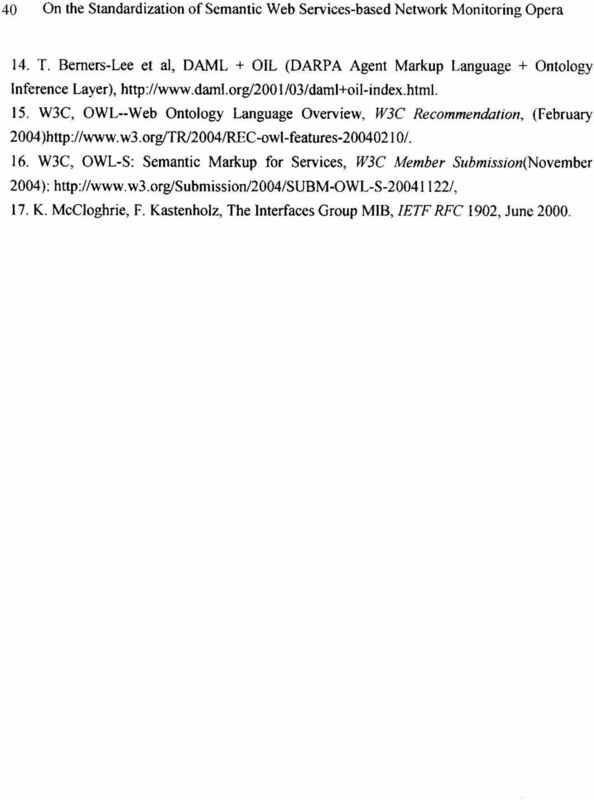 W3C, OWL-S: Semantic Markup for Services, W3C Member Submission(]^oyemher 2004): K. McCloghrie, F. Kastenholz, The Interfaces Group MIB, IETF RFC 1902, June 2000. A FRAMEWORK FOR IMPROVING TRACTABILITY IN SOFTWARE DEVELOPMENT SAMBIT PATNAIK MURAT M. TANIK, COMMITTEE CHAIR GARY J. GRIMES MURAT N.
2 (18) - SOFTWARE ARCHITECTURE Service Oriented Architecture - Sven Arne Andreasson - Computer Science and Engineering. ITU-T Kaleidoscope Conference Innovations in NGN. Managing NGN using the SOA Philosophy. Y. Fun Hu University of Bradford y.f.hu@bradford.ac.